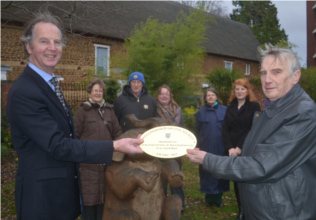 The award was presented to the Council on 27th December 2012 for Improving public amenity spaces with historic value. The Public Realm Strategy, adopted by the Borough Council in July 2009, identifies Croyland Gardens as an area for Public Realm improvement. The first phase, to create a zone of play with a new play space, based on a Zoo theme to celebrate the sites heritage and expand upon the existing sensory landscape and natural setting. In April 2011, a new play area was introduced in Croyland Gardens, situated outside the 16th Century Croyland Abbey and Croyland Hall and in the grounds of the Wellingborough Zoo Park, which closed down in 1970. The play area is aimed at the under 7s and features play equipment and sculptures to mark the zoo heritage. Local children were invited to enter an art competition to design some of the engravings which will feature on stone boulders and stepping stones throughout the play area. The boulders are engraved with designs from local children and reflect the zoo theme of the play area. A competition was open to all children living in Wellingborough under the age of 7 years to design an image to go on one of the boulders or stepping stones, and 28 designs were chosen. The winners range in age from as young as 3 years up to 7 years old, and Holly Walker's (aged 7) design was chosen as the project logo. The stepping stones will be laid after Christmas. An example of 4 year old Chloe Duffy's competition entry and how it appears set in stone. Between the 1940s and 1970s, Croyland Gardens was the home to Lions, Tigers and Bears as Wellingborough Zoo opened to the public in 1943. The first thing that visitors saw on entry was a goldfish pond. The zoo exhibited monkeys, lions, panthers, a baby elephant and a giant tortoise and even penguins. There are many stories relating to the Lion of Wellingborough zoo. The lion was taken to the cinema, the local park and generally treated like a pet. In fact the cinema event was captured on film by a local newspaper.